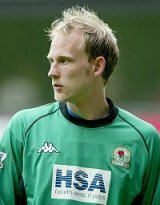 The 30 year old Finn replaces Kasper Schmeichel in the City squad and is in contention for a place against Sheff Weds this Saturday. The twice capped Finnish international made 51 appearances over a period of years for Aston Villa before his move to Blackburn where he's been in competition with Welshman Jason Brown to be Brad Freidel's understudy. The deal completed today sees him at Ninian Park until the end of the season.